With many of our piano students living in NYC, I thought it would be useful to talk about finding the right instrument for your city apartment or home. For many of our clients finding enough space for a full size piano can be a real challenge. Here are our recommendations for pianos that will fit in tight spaces. The Williams Allegro Hammer Action Digital Piano: This is a great piano for extremely small spaces. It’s a digital piano so it’s lightweight and easy to move. It can also be put away whenever extra space is needed. I have played this piano and can say that for an entry level keyboard its sounds are very rich and the hammer action of the keys is excellent for an entry level digital piano. Make sure you buy a keyboard stand and have a stool of appropriate height for practice time. The other advantage is that you can plug headphones into it for late night practice sessions. Essex EUP-108C: Let’s talk about acoustic pianos… Whether you are a professional pianist or a child taking piano lessons for the first time, there is nothing like playing on a real acoustic piano. This Essex model piano is one of the most compact and well-made instruments I have seen. The piano is affordable, well designed, plays well and sounds excellent. I had the pleasure of playing one recently and for such a small piano the sound is very big. This piano can fit into very small spaces and as far as pianos go, its super lightweight so it’s easy to move around if you have to. The piano also has a very stylish look that will fit well into any Upper East Side or Tribeca apartment. The best part about this piano is that it’s made by Steinway and Sons so it has all the latest engineering enhancements from their amazing development team at a fraction of the cost of an actual Steinway. This is definitely a great instrument for beginner piano lessons. Boston UP-118E PE: Here’s another great little piano. This one is slightly larger than the Essex but still small enough to fit into almost any room. The design of this instrument is definitely more traditional but the sound and performance is just as good – if not better than the Essex. Also made by Steinway, you are getting the same standards that has made that company famous for many years. Although this piano has a small footprint it is definitely a little heavier than the Essex so moving it around is slightly trickier. Any beginner student or professional would be very happy to own one of these instruments even if space was not an issue. Yamaha M560: This is a really nice piano. It’s definitely compact, so for apartments or small rooms it’s a great instrument. It’s really well made, sounds excellent and in my experience Yamaha pianos are real workhorses and can take a lot of abuse. It has a different sound than the Essex and Boston but all 3 are great when it comes to that experience. The design is very traditional and somewhat ornate. It’s not my favorite piano ascetically but a great instrument nonetheless. The Yamaha is close in size to the Boston but will still fit nicely where space is limited. Steinway 4510 Sheraton: This is my personal favorite of the small pianos. It’s actually smaller than the Yamaha but in my opinion has a bigger sound. It’s also super cool looking and will basically match any décor your home or apartment has. You can use this for beginner piano lessons in your home or it can be used professionally in the world’s best recording studios. It’s compact but maintains that authentic Steinway and Sons sound. The action on this piano is super quick for an upright as well. It’s also handcrafted in the same factory that Steinway grand pianos are made using the same process and craftsmanship. When you sit down and play this you can see it’s solid, sturdy and well-built but extremely artistic and visually appeasing at the same time. You can tell something extra went into this design. If I were learning how to play the piano this instrument would definitely keep me motivated to practice and constantly create. If you’re someone who is looking for a piano in NYC or anywhere else and have limited space these are my top choices. Choosing the right piano can absolutely make a difference in how you play, practice, learn and create music. These are all winners in my opinion. When the guitar teacher becomes the student, and other insights from one of our Rock Gods. Music to Your Home is lucky to be able to work with musicians from around the world, and Alejandro M. comes to us with words of wisdom from Argentina. 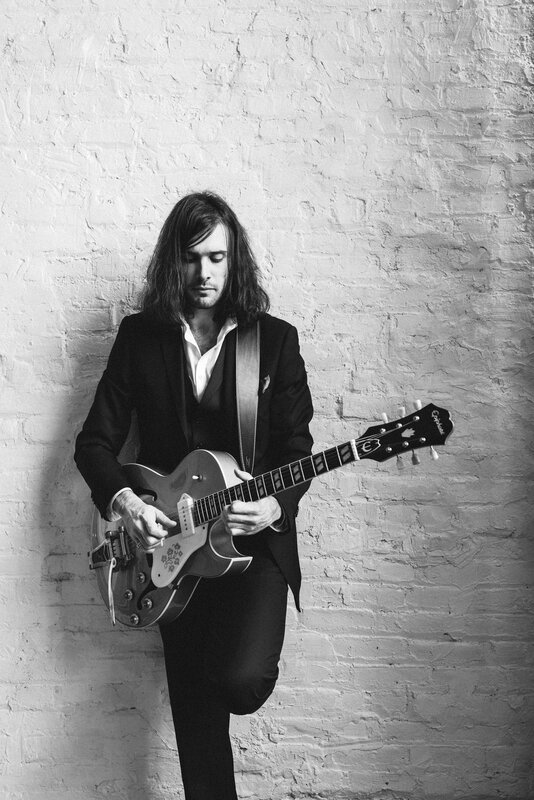 Currently he’s a professional guitar player and teacher living the dream and gigging all over NYC. 1) What advice would you give to parents who are considering getting guitar lessons for their children? Alejandro: I’d very much encourage them to do so! Music is a form of expression and a language that allows children to pour out feelings they might be too shy to share otherwise. Once they learn how to play, music is something that will accompany and grow up with and in them throughout the years. 2) Why do you think guitar lessons are so popular? Alejandro: Perhaps because guitar is a bit more accessible than other instruments. In the sense that with a few weeks practice you might be playing a first round of songs already. As opposed to violin or saxophone for example, that, while amazing instruments, they can be somehow more challenging. We can’t avoid mentioning that the guitar is the instrument most showcased in billboards, commercial adds, etc. being widely associated with pop/rock icons. That weighs in too on some level. 3) What is the right age for a child to start taking guitar lessons? Alejandro: I’d say after 10 years old. 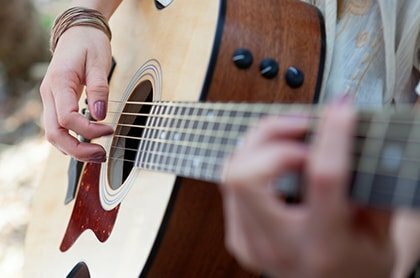 4) How much daily practice time does it take to become a good guitar player? Alejandro: There are no magic formulas. All the guys that play guitar really well, or any other instrument for that matter, it’s because they spent time with it. In that sense, I always tell students that it’s much better to practice maybe 10, 15 minutes every day, or every other day, rather than sitting down one day before the lesson and go for hours. Of course, the more time, the better. It’s a skill and needs to be developed regularly. 5) Do you incorporate finger exercises and note reading into your lessons? Alejandro: Definitely. Technique exercises are fundamental to begin gaining control over the fingers and have them do what you want, not the other way around. Note reading is also a very important aspect of my lessons but unless we’re aiming for classical pieces, I like to introduce the music notation system once we’re already playing some songs. Starting with a lot of theory from scratch in guitar for popular tunes can sometimes turn a bit overwhelming and non musical, in the practical sense. 6) What is the most popular style of music your students ask to learn? 7) What do you love about teaching guitar lessons? Alejandro: What I love the most is to watch how the student make progress – that can be very satisfying. And I also love the fact that I’m learning too. When you see someone taking their first steps with the guitar, in a way, I rediscover things and look at them from another perspective. When you don’t know, you associate things differently and arrive to different places, right or wrong. Places that perhaps after playing for 17 years I wouldn’t have thought of. 8) What was your most memorable teaching experience? Alejandro: Seeing former students that now have grown up, formed their own bands, performing live, writing their own songs, making their own records and their own musical statements. That’s the full circle, right there. 9) When and where was your most memorable performance? Alejandro: The last concert I did in Buenos Aires, in a theater, before moving to NYC. And the first here in New York as well, both very emotional milestones in my career. 10) Who are the guitarists that have inspired you? Alejandro: Many. But if I had to pick two, I’d go with Wes Montgomery & BB King. 11)What is your favorite type of music to play and what is your favorite guitar. Alejandro: Definitely Blues. My favorite guitar is the Fender Telecaster 72′ Custom Series. Or most of the hollow body ones. 12) What do you love about NY and being a musican in NY? Alejandro: From the city itself I love the diversity, the melting pot aspect of it. And as a musician I believe that being among such talented people, in every field, you inevitably become better. My songwriting grew a lot in the 4 years I’ve been living here. As an artist you’re a sponge that absorbs everything in your surroundings, and this is a very rich environment to be in. Alejandro is available for guitar lessons in NYC. Call us to schedule yours! 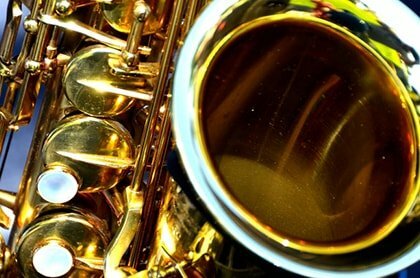 The Saxophone: Not just a Shiny Noisemaker! 1) What advice would you give to parents who are considering getting saxophone or other woodwind lessons for their children? Jim: I would say this about any instrument really, but take the plunge! How often does your child get one on one attention from a highly trained professional working in their field? I also like the idea of mentorship when it comes to learning music. Having somebody to look up to, imitate, and question is really important. I know the student-mentor relationship has been and continues to be integral for me as I master my craft, and I want to share that experience with others, as well. 2) What is the best woodwind instrument to start young students on? Jim: This is a really good question – For flute and clarinet players, students should start on their instrument of choice, but for saxophone players, there is some discussion. I know my teachers started me on clarinet before switching to saxophone, because the clarinet requires more technique and control. I also understand the argument for starting students on sax right away – if that’s the instrument they want to play and it’s going to keep them interested and involved in music, then maybe it’s right to skip the clarinet and go right to sax. I think it’s okay to start a young student on saxophone, especially if they’re getting a dedicated lesson time once a week. 3) What are some obstacles that saxophone or clarinet students face when learning how to play and how can they be overcome? Jim: I think a lot of it is just patience – with yourself and with the instrument. When you pick up a woodwind for the first time it can feel very awkward. You’re shoving a hunk of metal and wood and rubber into your face and it has all these buttons and levers and you can’t see what you’re doing with it. Our modern culture in a lot of ways is centered on ease of use – if we can’t operate a new phone or app within two minutes we give up. Saxophone, and other woodwinds, they’re different. They take patience and perseverance. You have to pace yourself, and give yourself time to grow and learn. 4) How much daily practice time does a beginner need to realize steady progress and become a proficient player? Jim: The short answer? About 15 minutes. With beginning students, getting acclimated and adjusted to the instrument is essential, and usually about 15 minutes of daily, uninterrupted, focused practice will help with that acclimation and learning the fundamentals of playing. There is also a lot going on with the muscles of your face and hands as you start a new instrument, and you don’t want to over extend yourself. Depending on the student and their goals on the instrument, 15 minutes can expand into longer periods in the first weeks or months. Personally, I think about my own practice from a more goal-orientated perspective, but for a lot of students, timing their practice is very helpful. 5) What benefits outside of music can come from learning the saxophone? Jim: Well I was talking about the patience aspect earlier, and I really think that’s huge. When I pick up a horn it can be very meditative for me. Working slowly on difficult passages, while it stresses some people out, really helps me to slow down and think about my problems methodically. Beyond that, I mean you could go through a ton of benefits that studies attribute to studying music. Improved test scores and all of that. Problem solving skills, motor skills, spatial skills, learning a new language, they all come into play when you’re learning music, and in real time. To me, when people talk about that stuff, what they’re getting at is that studying music (or really any other art) helps you to become a more complete person. 6) What do you love about teaching and being a performer in NYC? Jim: My favorite part about teaching and playing in New York is the people that I meet and work with, without a doubt. The people I know on Music To Your Home’s teacher list are great examples – Lena H. (woodwinds), Manuel S. (piano), Daan K. (guitar), Tim T. (drums), Owen B. (woodwinds). These men and women aren’t just formidable musicians, but amazing and inspiring people to be around. Honestly, they are the reason I work so hard to be the best musician and person I can be. 7) What was your most memorable teaching experience? Jim: I was working with a student when I lived in the Midwest. He and I basically started together while he was in middle school, and we had a really good rapport all the way through high school. When I moved to New York we stopped working together, but we kept in touch. When he did his first solo recital as a high school senior he wrote a very heartfelt thank you to me in the program – knowing that I couldn’t be at the performance and that I would probably never read it myself. An old professor of mine actually sent me a picture – I’m not actually sure that the student ever knew I read his thank you. I think about that to this day, and how much of an impact a teacher can have on his or her students, and vice versa, and how cool that can be. 8) When and where was your most memorable performance? Jim: This is a really difficult question – the “big” performances either featuring my music or at important venues or with important people, they’re memorable in their own way, but the performances I really cherish are the times that the music was really happening. I remember one time specifically, we were playing with this jazz-funk band at this dive – and for whatever reason, the whole band just clicked. We opened up to all these new territories and opportunities; it was like everything was brand new. It was really a beautiful moment. And even though we were on this little stage with only a handful of people in the audience, everyone was laughing and smiling by the end. Those are the moments I really live for as a performer. 9) Who are you musical influences? Jim: I probably have too many to list. For jazz; Charlie Parker, Cannonball Adderley, Wayne Shorter, John Coltrane, Hank Mobley, Warne Marsh, Herbie Hancock, Bill Evans, and Mark Turner are just a few of my favorites on a long and ever-growing list. For more rock or funk influenced music (because I end up playing a lot of it) I look to Maceo Parker, Lennie Pickett, John Scofield, and Kenny Garrett for inspiration. 10) Do you have a preferred woodwind method book for beginner students? Jim: The Standard of Excellence series by Bruce Pearson or the Rubank books are my favorite methods for people just starting out. There are some great jazz methods by Lennie Niehaus and Jim Sniedero I really like once the student has some faculty on the instrument. I also use a lot of my own material in my teaching – not only do I work on pedagogical material for all my students’ benefit, but I like writing stuff for individuals as well. I think about teaching – especially one on one lessons – as a two way street. There are a lot of ways to solve a problem; why not cultivate an individual’s problem-solving capabilities instead of just telling them what’s “right” and what’s “wrong?” In this way, we’re learning how to be human beings and artists instead of just pushing buttons on a shiny noisemaker. Plus it’s just way more fun. One of our favorite NYC piano teachers, Rita R. answered some often asked and important questions about piano lessons, her teaching philosohpy and favorite musical moments. 1) What advice would you give to parents who are considering getting piano lessons for their children? Rita: Piano lessons are a great way to introduce children to music and deeper understandings of history, culture, and expression in a way that is fun and interactive. Their appreciation for music will stay with them for the rest of their lives and they will grow in every way! 2) Why do you think the piano is such a popular instrument for very young students? Rita: The piano is a very visual and tactile instrument. Because of the many different ways to play, very young children can develop their fine motor skills as well as their ear. They can distinguish different sounds, high and low, patterns and string it all together to make music. 3) What are some obstacles that piano students face when learning how to play and how can they be overcome? Rita: Many students struggle with not understanding right away, or having a harder time multitasking (thinking about finger patterns, hand shape, rhythm and notes all at the same time), but we work on those things all the time by taking each component and working on it separately, and going at the pace of the student. I tailor every lesson to the student’s interests so that they can progress and enjoy musicmaking. Rita: Daily practice is very important, but the amount is less important than the point of practice. Every practice session should have a goal, even if it’s tackling only one tricky measure. If it takes 5 minutes or 30, it’s still an accomplishment. Practice goals are more important than setting a time. 5) What benefits can come from learning the piano? Rita: Piano gives an understanding of music, history, and art. It helps students in multitasking, working in an intelligent and time-efficient way, and handling projects easily. Music helps in recognizing patterns, fine motor skills, work ethic, and most importantly gives students an outlet for expression. 6) What do you love about teaching piano and being a performer? Rita: I tailor my lessons to my students, and the more I teach the more I learn about my own approach. I also really enjoy working with students of all ages – every student brings their own interests and personalities, and we end up learning from each other. It is also a privilege to pass on what I have learned from my own teachers and mentors. As a performer, I enjoy sharing my connection to the music with my audience, and it’s an amazing experience. Rita: The moment when a student realizes that they can do what the music is asking is always memorable! Rita: My senior recital and my Masters recital were both big events because they signified a culmination of my own understanding of music and style, helped by my wonderful teachers. They were also jumping off points for my future performances. When Should My Child Start Voice Lessons? Now! Unlike the guitar, saxophone or piano, when it comes to singing, your body IS your instrument. And we all know that taking care of our bodies is not only paramount to living a healthy life but also helps you sing to your full potential. So when it comes to the idea of little kids starting voice lessons there’s a bit of confusion so allow me, someone who started formal singing lessons at 5 years old and with not a nodule in sight, to clear up any misconceptions. Let’s begin by saying that most likely your 6 year old isn’t chomping at the bit to sing Italian Art Songs. If they are? Cool, we’ll cover that so read on. They probably enjoy singing the soundtrack to the latest Disney hit or Taylor Swift song. 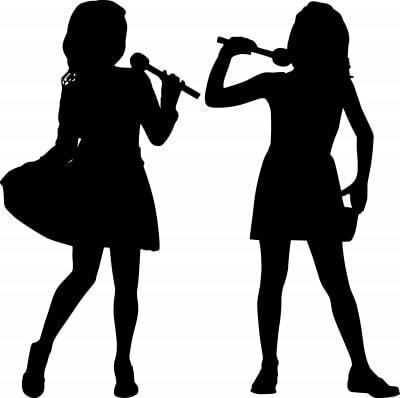 Either way, professionally trained voice teachers know that working with voices that haven’t matured yet require tapping into a skill-set and repertoire that accommodate an undeveloped body and mind. Our philosophy is pretty simple, we think kids playing music, any kind of music, is igniting that part of the brain those newspaper articles are always talking about, so we’ll teach any song a kid wants, and we’ll show them how to sing it in such a way that they are laying the groundwork for correct vocal technique while having fun! Yes, it’s possible! The first song I learned how to sing was the theme to Sesame Street. My teacher knew I loved it, it was simple, familiar, and I enjoyed practicing it every day. I eventually moved on to show tunes, ran through the Les Miz book, the Rogers & Hammerstein classics, discovered the Tapestry record, was introduced to Italian Arias and opera, fell in love with jazz, all the while rock and folk rested closely in my heart. But the point I’m making is that every genre I sang as I grew up, I was always using proper technique because my teachers recognized the right repertoire to suit my age and growing body. Kids today have shows like The Voice to inspire them- and that’s amazing, but some of those contestants have no formal training and are actually straining their voices pretty badly. You can hear a lot of them “sitting” on their vocal chords, putting all that tension on the throat where it doesn’t belong. That’s the damaging stuff we are avoiding with proper coaching. So are we looking to have your six-year old work on their belly breathing and tongue position? We’ll get there over time, but for now that child will enjoy singing their favorite songs while the seeds to formal training are planted. And you can rest easy knowing they’ll be no permanent damage in sight for your young musician. For in-home singing lessons, visit our singing lessons page. Playing piano is a major stress reducer: One of the things we hear most from our adult clients is that after a long day at the office, playing the piano at home has a real calming effect on their moods. Playing the piano can refocus your energy and help you become a more creative person. Listening to music can be totally soothing – but the act of performing it can take your mind away from that annoying day at work. Our younger students have experienced the exact same reactions to practicing their instruments. After a day of classes, tests and afterschool activities playing the piano or taking a piano lesson can help relieve anxiety and stress in children as well. Playing the piano is good for your brain: Studies have shown that children who begin learning piano at a very young age have better general and spatial cognitive development than children of the same age who have not learned piano. 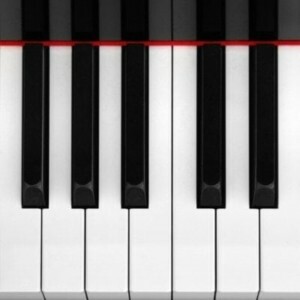 Studying piano can also boost math and reading skills. In addition, taking piano lessons helps with concentration and can therefore improve a students’ overall school performance. Playing the piano can help you become a great multitasker: Unlike any other instrument, the piano is unique because you are forced to have two totally different things going on with each hand at the same time. Your brain splits two very complex tasks, (reading treble and bass clefs) between the right and left hand. With practice, putting these tasks together at the same time makes for some really nice music and also trains your brain to focus on several things at once. Playing the piano builds self- confidence: We’ve seen this many times with our students. After learning a piece from start to finish even the shyest student will have a feeling of accomplishment. It takes patience, hard work, determination and a love of music to learn the piano and finishing a difficult piece or participating in a performance is a real confidence builder for many people. Performing in recitals at a young age can help students become more comfortable speaking in front large groups and can help make them more confident in social situations. Playing the piano is cool: Well it is… Discovering that you have a talent for playing piano is a great feeling. Sitting down and entertaining at a party or social event will always grab people’s attention and can possibly make you more interesting to others. If you’re not sold on this theory just ask a Billy Joel or an Elton John fan! What do you call someone who hangs around with musicians? A Drummer. 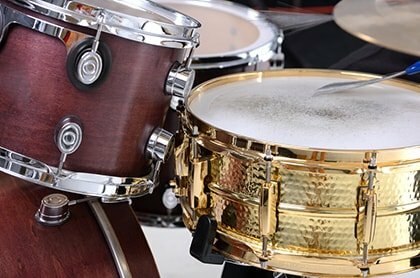 OK, it’s no secret among musicians that drummers get a bad rap – but Music to Your Home knows how valuable drumming is within a band and are here to dispel those myths and put to rest any notion that drumming isn’t as much a part of a band than any other instrument. We hope that you will also appreciate the level of talent our top 5 favorite rock drummers possess. So here they are in no particular order. Ringo Starr makes our list because no matter what, when you are in the world’s greatest rock band you make the list. Yes, we know Paul played drums on many of their studio recordings, but we still highlight his skill because eventually all those studio versions were played live, and he nailed them. Each and every time. We’ve heard the story of how The Beatles stormed America, slayed it at Shea stadium, killed it on Ed Sullivan, etc. and Ringo was there for all of it. Neil Peart’s drum kit alone should have its own place on our list, but a kit is nothing without an absolute master behind it. Neil’s command of his elaborate drum set is a thing of beauty, and to watch him work out such intricacies within Rush’s complex arrangements for any music fan is a thrill. His fills on Rush’s Clockwork Angels tour are off the charts good. It’s no wonder Rush is known as the musicians’ musicians. With a guy like that in your rhythm section, the musical possibilities are limitless. Carter Beauford’s father was a jazz trumpeter, and Carter started out studying jazz, and it’s apparent when you hear him play. His fills are often melodic, and we found a cool example of him playing Dave’s guitar melody within the four minute and 30 second, yes, that’s correct, the 4:30 long intro to “Say Goodbye.” See if you can hear it too. John Henry Bonham, the thundering powerhouse of Led Zeppelin – often imitated and never duplicated, though many of us have tried. The scope of his influence remains, and we’d be hard pressed to find drummers playing any genre of music who wouldn’t cite Bonham as one of their heroes. The proof is here. Turn up the volume and listen to this guy go for it. There are so many more unbelievable drummers out there, yes, we’re talking about you Dave Grohl, Mike Portnoy, Charlie Watts, Steve Gadd and Roger Taylor among others. We hear you loud and clear and we think you guys are amazing. I’m sure all our readers have opinions too, and we want to know them. Feel free to attach some of your favorite solos or tell us about your ultimate rock drummer. Playing the guitar should be fun right? If you’re the type of person we like to call a “strummer” and you’re not looking to rip a technical solo, then this list of songs is perfect for you. Most of these tunes use only 4 or 5 chords and are great for singing along to. This list is sure to impress your guests at your next BBQ. This is such an iconic rock song. Practically everybody knows it. To play it in the same key as Tom Petty, put a capo on the 3rd fret and play D, A, G and you’ve got it. The entire song is basically just 3 chords! Singing it like Tom is another challenge and we’ll save that tip for another blog. This is an extremely powerful song. It has a short and simple intro that can be found here: http://tabs.ultimate-guitar.com/b/bob_marley/redemption_song_tab.htm The chords are crafted in such a way to create an emotional atmosphere for anyone listening. The best part is any beginner can master this one. It’s also another great song to sing along to without worrying about complicated chord changes. Sheryl Crow is an incredible composer. This song uses a few basic chords. The verse and Chorus is D, G, Bm and A with a bridge using Em, Bm C and A. Not really a lot but another easy and fun song to play. If you’re not a girl, go find one to sing this with and you’ll be in business. Here is a song that is known internationally. Everyone has their opinions about Oasis but no matter what they are, there is no disputing the popularity of this song. The acoustic guitar strumming the intro is so recognizable but easy to play. Throw a capo on the 2nd fret and play Em, G, D, and A and that’s basically it. The chorus uses C, D and Em. There are some extensions to these chords, but for a beginner the basic forms will work nicely. This is a song that everyone will love to sing along to. We know you’ve been eagerly awaiting the letter from your child’s school with their new teacher for the year, but summer is almost over and you haven’t heard yet. There is another exciting piece of mail headed your way – one that we get particularly thrilled about – instrument selection. If you have no idea where to begin, let us be your guide. Most schools offer four different categories of instruments you can choose from. Woodwinds: This family of instruments includes flute, clarinet, saxophone, oboe, bassoon and piccolo. These instruments are generally small and easy to transport in a school bus, car or can be carried by kids who walk to school. 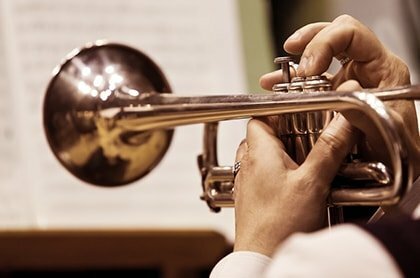 Playing one of these instruments can also lead to your child being included in the concert band, marching band, jazz band or school orchestra. Some schools offer the recorder the year before introducing woodwind instruments to familiarize students with holding an instrument and using their breath and body to produce sound. The other good thing about woodwind instruments is that they come in many different sizes. 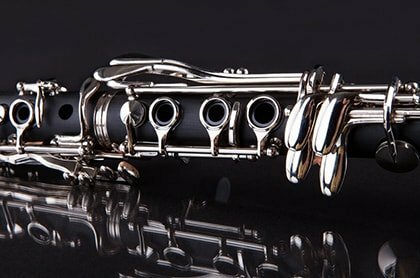 So if your child is not physically able to handle a large tenor sax – the flute or clarinet may be more suitable. Brass: This group includes the trumpet, French horn, trombone, and tuba. These instruments will also lead to being part of concert bands, marching bands, jazz bands and orchestras. I’m not going to lie… these can be loud! But with patience and practice they can be very rewarding to play and listen to. These instruments can also be transported pretty easily with the exception of the tuba. Brass instruments also come in many different sizes giving a variety of students different choices. Strings: The string family features the violin, viola, cello and double bass. These are my favorites! These instruments are more geared for playing in the school orchestra but can always be used in other ensembles as well. Generally the violin and viola can be transported on a bus but cellos and basses may need to be driven to school or lessons. 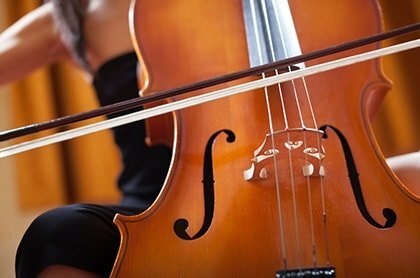 One of the great things about the string group is that each one comes in different sizes from half size to full size so even the smallest student can learn to play an instrument like the cello or double bass. Percussion: This family has the snare drum, drum set, timpani, cymbals, and xylophone. Generally, beginners learn how to play using a drum pad, which looks like a snare drum but is muted so it has very little sound. You’re welcome for that tidbit! Most elementary schools only offer the snare and bass drum to start and eventually add in the other percussion instruments as the students get into middle and high school. Most schools have these instruments so transporting is not generally an issue. Drum pads or electric drums can be kept at home for practicing. Most schools offer lessons on these instruments one time a week in a group setting. Adding in a private lesson with one of our teachers will definitely give any student a real advantage and help them learn and master their instruments much faster. Practicing is the hardest part about playing piano. But if you don’t practice, it’s pretty obvious, and your music lessons just don’t go as well when your teacher can tell that you don’t care. In my experience, I’m most excited to practice when I can get excited about what I’m playing. Beethoven’s Fifth, for example, is probably one of the most awesome pieces of music in the history of the world. In fact, the seventy-five minutes it takes to play the Fifth were what inspired the length of CDs. If you were working to play that during your piano lessons, how could you not be excited about practicing? When the Fifth was originally performed in 1808, it was not a critical success. The orchestra played so poorly that Beethoven apparently had to stop the performance! Granted, the orchestra had only had one rehearsal, but the cold auditorium and the length of the performance, a four hour long concert during which the Sixth Symphony was played first and the Fifth during the second half, made the audience even less responsive. A year and a half later, a review of the published Fifth appeared in which it called the piece one of the most important works of music of the time. The time being during Napoleon’s occupation of Vienna. Supposedly, the famous first four notes represent Fate knocking on a door. How cool is that? Needless to say, Beethoven has been revered through all stages of rock ‘n’ roll, from “Roll Over Beethoven” by Chuck Berry, to “A Fifth of Beethoven,” the classic disco tune from “Saturday Night Fever.” To really get excited about your piano classes, it’s best to play something you recognize, and when you choose to play Beethoven’s Fifth, you’re choosing one of the most recognizable pieces of music the world has ever known.